Le village e-zine > Recommended Addresses > The Carlyle New York City – An Oasis of Understated Luxury. The Carlyle is surrounded by galleries and designer boutiques on New York’s posh Madison Avenue. Blocks from the Metropolitan Museum of Art, the Guggenheim, the Whitney and the Frick, the hotel is within easy reach of what is commonly referred to as the “Museum Mile.” La Guardia Airport is approximately 30 minutes by car; Kennedy Airport and Newark Airport are approximately 45 minutes by car. Reputedly named for British essayist Thomas Carlyle, the 35-story hotel, designed by the architectural firm of Bien & Prince, was completed in 1930. A newspaper account of the time described the design as a “diversified setback style,” which provides private terraces for some guest rooms and suites. Despite the much-altered Manhattan skyline during the past 75 years, The Carlyle continues to dominate the Upper East Side over which it presides. The Carlyle’s guest list reads like a “Who’s Who” of world business and entertainment affairs. Every American president since Truman has visited. Its rich history includes visiting Royals and heads-of-state — HRH, The Prince of Wales; the late Diana, Princess of Wales; their Majesties, the Kings and Queens of Denmark, Greece, Spain and Sweden have all visited. The Carlyle is a mecca for the world’s most influential individuals from the art world, be they collectors, curators, or gallery owners. Fervent shoppers can enjoy the large selection of fine international shops and stores for which Madison Avenue is celebrated. The strong Art Deco influence, introduced by the hotel’s first decorator Dorothy Draper, has been meticulously maintained, from the famed black and white marbled lobby to Art Deco motifs of the hotel’s specialty suites. The rooms and suites are continuously updated with contemporary interpretation of understated elegance achieved by both Draper and the late Mark Hampton. In 2002, interior designer Thierry Despont restored Bemelmans Bar and the Lobby while the Café Carlyle, restored by Scott Salvator, and the Banquet Space, were renovated by Matthew White and Frank Webb, in 2007. Furnished in classic Louis XVI style with color schemes ranging from Chinese red to celadon, the hotel’s 124 guest rooms offer aristocratic elegance and absolute comfort. Audubon prints, architectural renderings by Piranesi and English country scenes by Kips adorn the walls. Porcelain lamps and vases, as well as china ashtrays designed exclusively for The Carlyle by Limoges, add a graceful touch. Bathrooms are finished in marble, many with whirlpool tubs. Beds are made with Yves Delorme duvet covers and bed linens. The pinnacle of luxury for over 75 years, The Carlyle’s 64 spacious suites, including the Tower and Royal Suites, are generously sized, lavishly appointed and distinctively furnished. Each offers ample living space to relax and entertain, and many have enlarged and remodeled bathrooms, complete with separate tubs and showers and stunning Nero Marquina and Thassos marble finishes. Tower suites have large picture windows that take in the breadth of Central Park and the Jacqueline Kennedy Onassis reservoir. In keeping with the hotel’s musical heritage and residential style, several suites feature Steinway or Baldwin baby grand pianos. All suites feature plasma HDTV and high-speed Internet access for the guest’s convenience and pleasure. In-room and in-suite dining 24 hours a day; concierge to take care of every need, maid service twice daily, babysitting and pet care available; secretarial services. 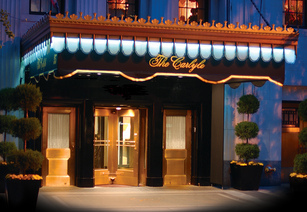 The Carlyle employs a staff in excess of 400 to cater to the comfort of all guests. Guests, residents and local Manhattanites have access to an elegant, urbane retreat; a luxurious and intimate spa, with magnificent design elements – designed by Mark Zeff of Zeff Designs – and professional services. Sense® spa at The Carlyle, continues the hotel’s tradition of providing guests with an oasis of luxury and tranquility in the heart of the city. Featuring Sisley, the premier brand in high-end skincare products, every spa treatment is an expression of The Carlyle’s dedication to providing the ultimate in luxury experiences. Located on the third floor, the spa features the Yves Durif Hair Salon. Hair stylist to the stars, Yves Durif provides guests with the upmost grooming and pampering on the Upper East Side. The spa also features five treatments rooms, a relaxation room, a special couple’s suite and separate men’s and women’s changing rooms, each with their own steam room. Ensuring that guests are able to stick to their fitness plans while on vacation, The Carlyle’s fitness studio, located within Sense® spa, features state-of-the-art fitness equipment from Technogym® as well as on-site trainers. The Carlyle’s banquet suites include a discreet and polished staff with world-class dining and entertainment. Stretching over 3,781 square feet, the Versailles and Trianon suites can truly play host to any event, and are ideal settings for parties, weddings and anniversaries as well as board meetings and business entertainment. A full cadre of catering menus and customized services are also available to complement the setting, including an on-site floral designer, L’Olivier.